Searching for turkey? You're not alone. 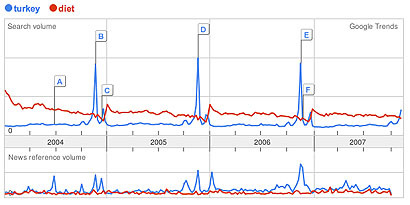 Google Trends on what we've got on the brain this holiday season. The picture above is from Google Trends, the fun tool that lets you measure the popularity of various keywords on the search site. The blue line shows a spike in searches for "turkey" every year on Thanksgiving, followed by another smaller spike around Christmas; the red line, measuring the popularity of the search term "diet," shows that come January, many of us are looking to turn over a new leaf. Pokemon vs. Ron Paul vs. Hillary Clinton vs. John Edwards. Hangover (check out the New Year's spike).